Children’s Books We Love! : Chinese Adoption | OFF KLTR! OFF KLTR’S FAVORITE ADOPTION STORY! Here’s a list of some of OFF KLTR’s favorite adoption books that focus on China. Tomorrow I will highlight our favorite general (not country specific) adoption books. Please send me your family’s favorites! I Love you like Crazy Cakes by Rose Lewis, 2000. Story of a single-mother’s adoption of a little girl in China. Very young readers. Every Year on Your Birthday by Rose Lewis. Brown Young Readers, 2007. The book begins, “Every year on your birthday, I think about the day you were born. I wasn’t there, but I was thinking about you as I waited at home to be your new mother”. This beautifully illustrated book is about a single mother and her daughter, a Chinese adoptee. The book shows how the family incorporates the child’s birth culture into their lives. This is a lovely book for transracial and transcultural adoptees and their families. It celebrates differences and what makes us uniqueness, as well as the similarities we share. Motherbridge of Love by Xinran. Barefoot Books, 2007. Xinran’s book is actually a beautiful poem that celebrates a Chinese adoptee and her two mothers: her birth mother and her adoptive mother. For example, the poem explains, “The first one gave you life; the second taught you to live it…”. It is truly a lovely book. Orange Peel’s Pocket by Grace Lin. Abrams Books for Young Readers, 2010. Following a classroom discussion about China, a Chinese-American little girl who was adopted realizes that she knows very little about China. So, while she and her mother run errands afterschool, the little girl tries to learn more about her birthplace from the Chinese people in her neighborhood. Our baby from China: An Adoption Story by Nancy D’Antonio. Whitman, 1997. The story is written and photographed by an American couple that goes to China to adopt a baby. It’s the story of their adoption journey. It’s a bit dated now, but it captures the spirit of an adoption trip quite well. Note: written for a younger audience than When You Were Born in China (see below). 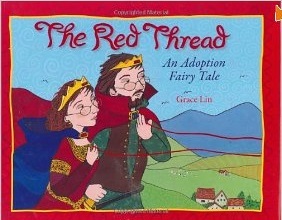 The Red Thread: An Adoption Fairy Tale by Grace Lin. Albert Whitman & Co, 2007. This is the OFF KLTR all time favorite adoption book! Grace Lin’s lovely adoption fairy tale revolves around the ancient Chinese belief that “an invisible, unbreakable red thread connects all who are destined to be together”. Star of the Week: A Story of Love, Adoption, and Brownies with Sprinkles by Darlene Friedman. The story is about a Chinese adoptee’s turn to be “star of the week” in her kindergarten class. This lovely story reveals the adopted child’s thoughts and wonders about her birth family. This book is most appropriate for kids first grade and up. It’s a lovely story about a Chinese-American girl and tells her story through (all of her) names: her first name, which she does not know (her birth mom whispered it to her), her Chinese name (from the nannies in the orphanage), and her American name (from her forever family). The book does a nice job on the topic of birth mothers. This is a well-written non-fiction book with photographs. It’s older now…but packed with really good information. « Adoption Journey: Home Six Months! We love the Rose Lewis books I have been reading them to Mattie since he came home. Thanks for the list of books will pick a few of them up because Mattie has been asking more questions about China and his family in CHina I definately need more resources. I am the story time guy. The Red Thread is one of my favorites. Great story! I also the Three Names of Me. Keira always likes it when I read these stories.